Have you ever KEM playing cards in poker games? As one of the most famous poker card in market, KEM cards are used widely in many occasions. We can use the best invisible ink to process them as professional KEM marked decks. 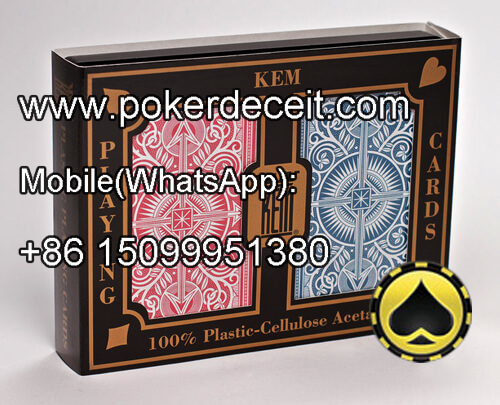 KEM playing cards are wonderful and reliable for many poker players, and the invisible ink KEM marked decks we supply as well. Due to the excellent invisible ink recipe and stringent marked cards printer, our technicians can mark the best invisible ink KEM marked decks. Before using this magic KEM marked playing cards in poker games, you need to wearing a pair of luminous contact lenses for playing cards or infrared sunglasses to see invisible ink, then you can see the invisible ink markings on the backs of marked deck cards easily and clearly, while others without these magic marked cards kit cannot find any difference. KEM cards are 100% plastic material and we can customize the markings on the backs of KEM marked deck cards accordance with customers special requirement.